Death is always untimely, but rarely more so than in the case of Roy Orbison, who succumbed to a heart attack in 1988 as his career was moving into high gear for the first time since his glory days in the '60s. Born in Vernon, Texas, on April 23 of 1936, he was one of the original Sun Records rockabilly artists and went on to become one of the most distinctive singers of the rock and roll era. Along with Elvis Presley, Jerry Lee Lewis, Buddy Holly and the Everly Brothers, he was a country-bred musician considered highly influential in the worldwide rise of the music that defined a generation. While he was young his family moved to the oil town of Wink, where his father supervised crews in the oil fields. As might be expected of a boy growing up in Texas, his early influences were almost all country and gospel based. His father and uncle were both music fans, and had Roy singing at shows and on radio before he was ten. By the time he was in his early teens, Roy and his band, the Wink Westerners, were traveling all around West Texas. When he was sixteen he represented The State of Texas at the International Lions Convention in Chicago. Roy spent two years at North Texas State University, outside Dallas-Fort Worth. He had planned to study geology because of his father's work in the oil fields. While at North Texas State, he met a young theatre student with show-business ambitions named Pat Boone. Boone encouraged him to pursue his music and Roy decided to take the advice and put together a new band. His live performances brought him into contact with a young Johnny Cash who helped get his material into the hands of Sun Records owner Sam Phillips. The result was his first hit record, Ooby Dooby, released in 1956. After leaving Sun, Roy moved to Nashville and became a songwriter for Acuff-Rose Publishing. In 1960 he offered one of his new compositions to Elvis Presley and then to the Everly Brothers. After having no success in getting either to record the song, he decided to do it himself. The result was the smash hit record, Only The Lonely. He had discovered the magic and defined his trademark style. The next few years brought more hit records. Running Scared, Crying, Candy Man, Dream Baby, In Dreams, Mean Woman Blues, Blue Bayou, It's Over and Pretty Woman all helped propel Roy Orbison to become one of the biggest stars of his generation. In 1963 The Beatles felt privileged to tour with him throughout England. The rapport he established with European fans remained strong for decades. Tragedy struck Roy Orbison in 1966. His wife Claudette was killed as a result of a motorcycle accident. Stunned and disorganized, he sought escape in an ever more intensive concert schedule. He was finding it difficult to work his way out of the turmoil and spent the months just surviving. By 1967 it seemed that Roy had weathered out the storm. He was finding it easier to write songs again and plans were started for recording sessions set toward the release of a new album. Then tragedy struck again with twice the force. A fire at his Nashville home killed two of his three children. After weeks of grief he gave up writing to immerse himself in the grinding world of concert touring. Through the years that followed, Roy Orbison kept up a flurry of activity. He re-recorded many of his old hits and released them on a retrospective album. He teamed up with many top contemporary artists like Bruce Springsteen, Bonnie Raitt, k.d. lang, and Jackson Brown to film a concert for HBO called, A Black and White Night Live, which produced an album of the same name. He toured constantly in Europe and Asia. He formed a new group with Bob Dylan, Tom Petty, Jeff Lynne, and George Harrison called the Traveling Wilburys and they performed masquerading as a band of brothers. Roy was known as Lefty Wilbury. He won his first Grammy Award for the song, That Lovin' You Feelin' Again, recorded with Emmylou Harris in 1980. The program, Salute To Roy Orbison, was taped at the Cocoanut Grove in Los Angeles for presentation as a Cinemax cable special. In late 1986, officials at the Rock and Roll Hall of Fame announced that Roy would be one of the new inductees. Everything was set for a full-fledged comeback when his brother Sam found him dead of a heart attack in Hendersonville, Tennessee. 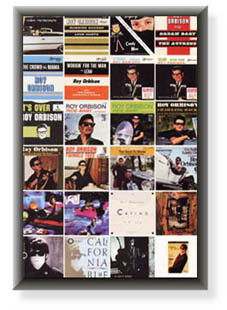 Roy Orbison's voice was one of the most remarkable instruments in music. He never battled the arrangements. His voice established the mood and the arrangements were crafted to heighten the tension that mirrored the atmosphere of his stories. He delivered songs that broke the standard song writing formula and came on instead like mini-operas on a scale that matched the emotions the lyrics described. At the induction dinner for the Rock and Roll Hall of Fame, held in 1987, Bruce Springsteen introduced one of his heroes. Said Springsteen, "When I went into the studio to record the album, Born To Run, I wanted to make a record with words like Bob Dylan that sounded like Phil Spector. But most of all, I wanted to sing like Roy Orbison. Now, everybody knows, nobody sings like Roy Orbison." Since 1968, Sam Orbison's life was dedicated to working for his brother Roy. But during the time after he found his brother dead of a heart attack on December 6, 1988, Sam remained focused on his biggest challenge of all - to maintain the legacy of the legendary performer. Sam co-produced The Roy Orbison Story and he travelled with the show for many years. It is clear that while Roy's widow, Barbara, carried the responsibility of handling her husband's estate until her death in 2011, Sam was undeniably the guardian of his brother's image. At a press conference in Vancouver, Canada, he noted that Roy was always saddened by the sordid treatment of Elvis Presley in the aftermath of his death in 1977. In a later interview Sam challenged anyone who would sensationalize his brother's heartbreak-filled but dignified life. "They are welcome to try and dig up any negative stuff," he said with quiet confidence. "There's nothing there to find." With the success of his collaboration with Bob Dylan, George Harrison, Jeff Lynne and Tom Petty as the Traveling Wilburys, and also his duet with k.d. lang on Crying, Roy Orbison was enjoying his greatest period of popularity in twenty-five years. The normally private, reticent singer was adjusting to his higher profile. "He was coming out a bit," Sam said. "Barbara felt it was something he ought to do. He would spend time at a shopping centre. He was going out in public and he never would have done that before." During the early part of 1994 Sam Orbison was asked to help develop a musical presentation of his brother's career. 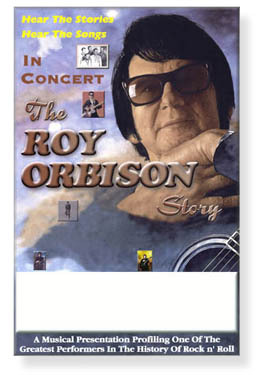 The show was to have its basis in a narrative accounting of Roy Orbison's life from his birth in West Texas to his death in 1988. 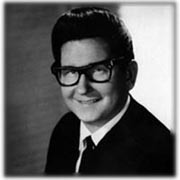 Throughout the commentary, which is delivered live, the music of Roy Orbison is sung by one of North America's premier Orbison impersonators, Bernie Jessome, and is supported by a fully live backup band. 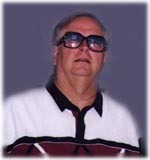 Bernie's work with The Legends of Rock and Roll in Canada, and with American Superstars throughout the United States, brought him to the attention of Sam Orbison. It was Bernie Jessome's selection to portray Roy Orbison that actually assured Sam's position as one of the show's producers. 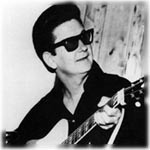 Sadly, Sam Orbison died in Texas on October 8, 2010. Bernie Jessome is one of North America's finest Roy Orbison impersonators. His delivery of hits like Pretty Woman and Only The Lonely reveals an incredible wide range voice mirroring the remarkable presence of Roy Orbison. There is always a hush in the room when Jessome takes centre stage as the hit singer/songwriter. Born in Glace Bay, Nova Scotia, home for the long time musician has been Toronto, Canada. He began his musical career singing with The Esquires and as his career took off he found himself opening for Roy Orbison and groups like The Beach Boys and The Rolling Stones. 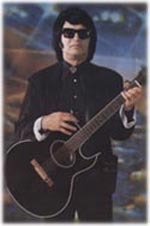 In 1991 he formed a Roy Orbison Tribute production called Shades of Yesterday. He then connected with the huge Legends of Rock and Roll organization and toured Canada and Europe cast in the role of Roy Orbison. Bernie has performed throughout the United States and spent more than a year with the U.S. based American Superstars. His spellbinding performances as Roy Orbison throughout England were the talk of the theatre circuit. He has performed in Las Vegas and most recently spent four months performing at the Grand Casino in Biloxi, Mississippi. The affiliation that began with Sam Orbison in 1994 sees Bernie still headlining The Roy Orbison Story today. Touring the continent in The Roy Orbison Story, Bernie Jessome is having the time of his life. The time and thought that went into the production of the show are remarkable. The extremely high calibre of the participants, the involvement Sam Orbison had and the warm and welcome reception from Roy Orbison fans throughout North America make this presentation a truly wonderful experience. Jessome comments, "Orbison was, in the eyes of Elvis Presley and many other great musicians, the best singer in the world. The tragedies of losing his wife in a motorcycle accident in 1966 and two years later losing two of his three sons to a house fire, didn't stop this unique person from continuing his musical work. He is a true legend and it is a privilege to sing in the memory of the irreplaceable Roy Orbison." The Roy Orbison Story chronicles the life and times of a classic figure from a bygone era of popular music. This musical presentation captures the spirit of the legendary singer/songwriter through a combination of narration and music. From his birth in West Texas to his death in 1988, the story is told under the strict guidelines that were developed and put in place by his brother Sam, who traveled with Roy as his business manager for many years. The songs are delivered by Bernie Jessome and a live band as the history winds from the early years in Texas, through the triumphs and tragedies, until the story ends in 1988. The first show deals with Roy Orbison's early years as his life unfolds in West Texas and he reaches the decisions that lead him into a lifelong commitment to music. His friendships with Pat Boone, Elvis Presley and Johnny Cash, his early attempts at recording, his association with Sun Records, his development as a songwriter, his life on the road and the breakthrough recordings that led to a phenomenal string of million selling records, are all recounted here in story and song. Audiences are treated to wonderful presentations of Ooby, Dooby, Only The Lonely, Blue Angel, Running Scared, Crying and Dream Baby as they are taken back to a time when music was made to last a lifetime. The second show takes the audience through the triumphs and tragedies that characterized the life of Roy Orbison throughout the sixties and beyond. More million selling records and his time in Europe and Great Britain, where a young English band called The Beatles was hired to open for him on his concert tour. The tragic death of his wife and the loss of his two sons are described. His triumph over the dark days and his faith in his music lead to work with Bob Dylan and George Harrison. His return to the top of the charts and his induction into the Rock and Roll Hall of Fame are all a part of the story. In Dreams, Mean Woman Blues, Blue Bayou, It's Over, You Got It, Pretty Woman and, what many people consider the most compelling voice in music, are all part of the story too. © Copyright 2015 AMERICAN NEWSREEL 1958 South Industrial, Ann Arbor, Michigan.